Pinterest is an amazing search engine packed with beautiful images known as pins. I can type the word ‘quilt’ or ‘fabric’ into pinterest and it will instantly load up thousands of pins for me to scroll down. Each one of those image leads to hundreds more. People with Pinterest accounts are known as Pinners. And their pins are arranged into Pinboards. Each board tends to have a common theme. For example, I have a different board for different color fabrics, one for red, one for green and so on. It is also a good way to collect equipment ideas and inspiration from photographs of beautiful interiors. Part of the reason that you can fill your boards so quickly using pinterest is that you don’t have to rely on scouring the internet and finding your own images. You can ‘re-pin’ images pinned by other Pinners. And any pin that you click on expands and fills the centre of your screen so that you can look at it in close up, but even more exciting is what happens underneath. If you now scroll down, you will find pinterest has loaded many more pins like the one you clicked on as suggestions of pins you might enjoy. Drawing you deeper and deeper into the site. The only problem is that it’s a bit like reading a good book, it can be hard to ‘put down’ and you may find yourself wandering a world of wonderful images, only to realise you have missed your doctor’s appointment or that it’s three in the morning. You can choose whether you search for individual pins, boards, or pinners. It is up to you. Pinterest is also a wonderful learning resource. If you use the ‘pin it’ button, when you click on your expanded pin, it will automatically take you to the web site you pinned it from. This means that it is a great place to store images from sewing tutorials. I have two sewing tutorials pin boards. One for general sewing and one for quilting tutorials. Anytime I need to look up how to do something and think I might need to go there again, I pin that tutorial to one of my pin boards. Even better, you can also pin youtube videos. This has to be one of the best learning features of pinterest. Youtube has to be one of the most powerful learning resources on the planet. There is virtually no practical topic on which youtube has no tutorials. 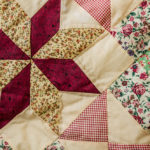 Most crafts can boast hundreds of youtube videos to help you grow your skills. Pinterest claims that it takes 15 seconds to set up an account. So I timed myself. I had my email address and chosen password available to hand. You can choose any old topic, just tick the first five you come to, you’ll change them once your account is set up. It was 55 seconds, not 15, but still. Not a huge chunk of your day. All that remains is to create your first board and start pinning! Is pinterest better than a real story board? Unequivocally yes. Pinterest is streets ahead of cardboard and glue. The internet has simply revolutionised our ability to find resources and to collect images of ideas for projects. You no longer need to scour the shops on foot to find images and sample. The simple addition of a pinterest ‘pin it’ button toolbar accessory to your browser will enable you to grab those images immediately you see them, and add them to whichever of your pinterest boards you choose. There is no comparison with the way I used to do things. 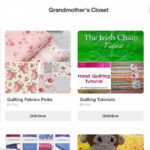 I set up my Grandmother’s Closet pinterest board to help me make my patchwork quilt on a cold wet Tuesday evening, and had enough images to fill several storyboards by the following day. By the weekend, I had collected over 300 fantastic and practically useful images, just by browsing and dipping in an out of pinterest during coffee breaks or while relaxing in the evenings. Not only is pinterest fast, it displays your images cleverly in a very visually appealing way. You can’t help but admire the way it does this at a click of your mouse, and no glue or scissors in sight. Last but now least, Pinterest is a social medium. It isn’t as ‘chatty’ as some of the others, but it is still a great place to link up with people who share your interests. Where Facebook and Twitter are often based around shared friendships and relationships, forums and Pinterest are based around shared interests. On forums these interests are largely displayed as text, they are rather clumsy in the way they handle images, on Pinterest, the reverse is true. This has the added advantage that you don’t have to spend hours explaining yourself or answering questions. Unlike most internet social gathering, I don’t think I have ever seen an argument on Pinterest. And though you can comment on pins if you want to, not many people do. I think this makes Pinterest a rather relaxing place to spend some time. Pinterest is free to use, easy to set up, and is an Aladdin’s cave of images and ideas for anyone interested in arts or crafts. It is a perfect storyboard builder and wonderful learning resource.